Back from Sweden with a bunch of treats! One of our newest international colleagues from Turkmenistan recently made a trip to attend the European Liver Conference in Stockholm. She signed up for today's slot and we expected a few things from Svenska like the Paprikakor or whatever we had had before. Although she did indeed bring a Swedish item or two the spread included far more. 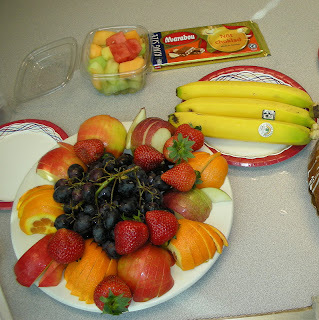 We got a cake, a great selection of fresh fruit - we are not against healthy food at cake hour - and the Swedish surprise. A spread upon the return from Sweden! Clearly it is chocolate with nuts! Now here is where you are going to learn some Swedish. 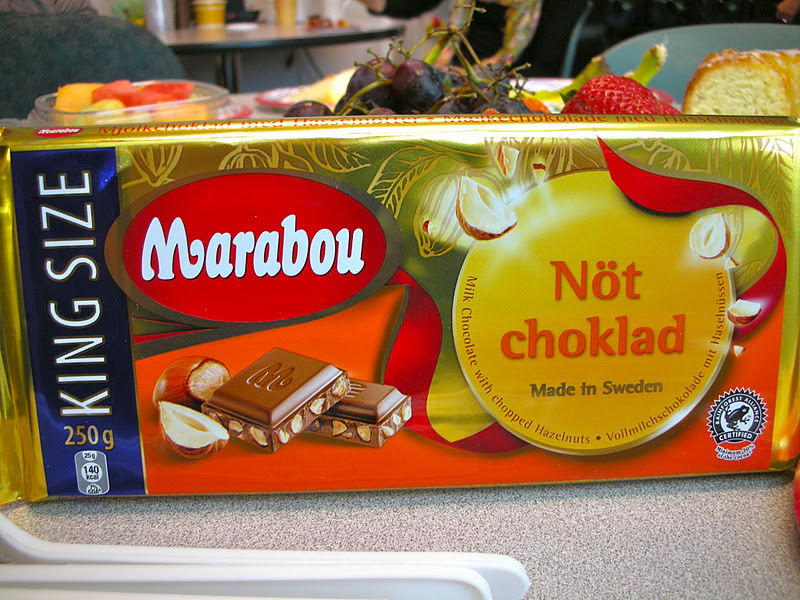 Our friend brought back a King Size bar of Marabou Nöt choklad Can you guess what that means? 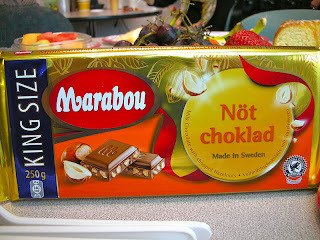 If you said chocolate with nuts you win and now understand your first expression in Swedish. So how about Melkesjokolade med Hasselnøtter? If you said Milk chocolate with Hazelnuts you win again and are now ready for advanced Swedish instruction. I do find it interesting that under the Swedish name it has first the description in English and German. It makes you wonder if this was intended for export! It was good milk chocolate with lots of nuts but I don't think the Swedes are going to displace the Swiss or the Germans for that matter, as the most notable chocolate manufacturers. 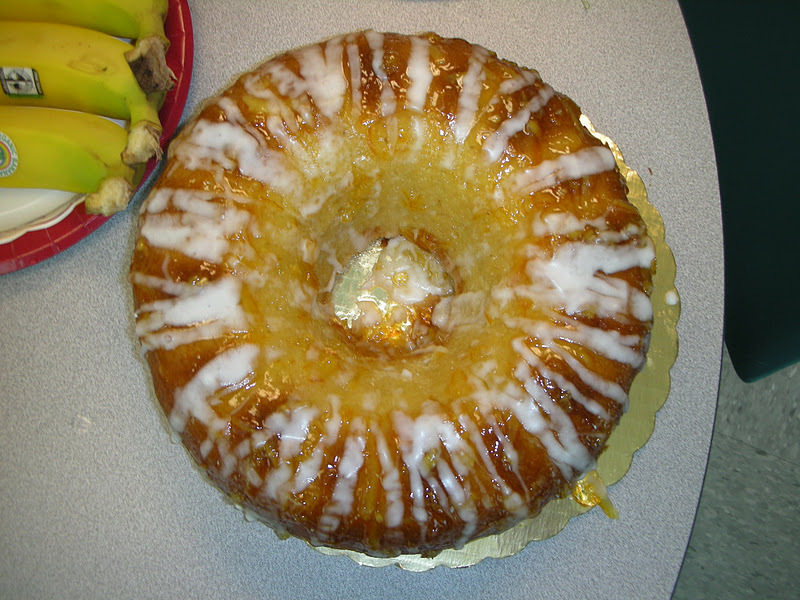 Nicely drizzled with sugar glaze and orange rind! In addition to the Nöt choklad there was also a great glazed orange coffee cake. It was a typical good yellow coffee cake with the sugary glaze that also included candied orange rind. This was also in the cake itself. 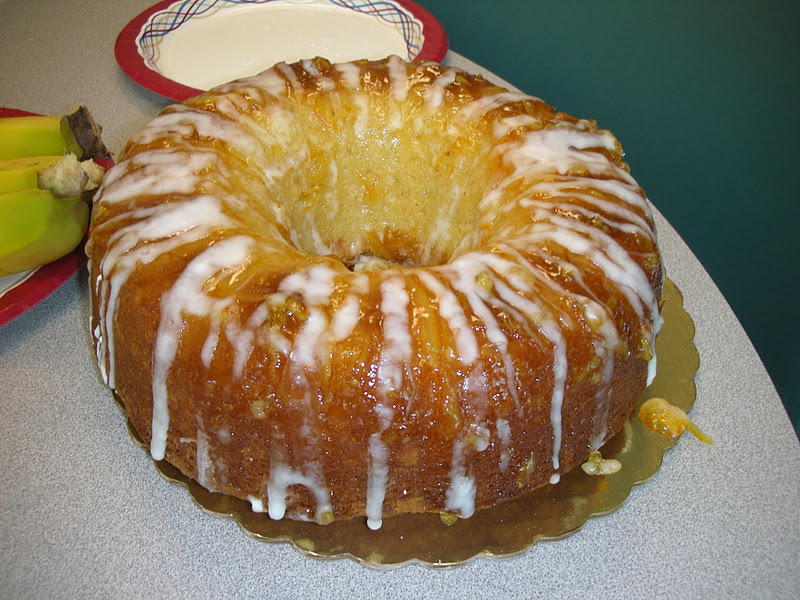 We never argue with coffee cakes and this one was very good, flavorful and moist. Healthy option and nicely presented! 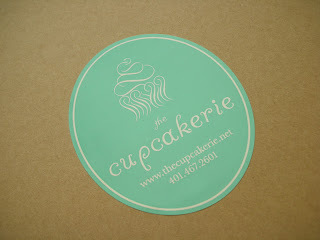 From Sweden via Turkmenistan to Cake Hour! Tack så mycket! But that was not all. 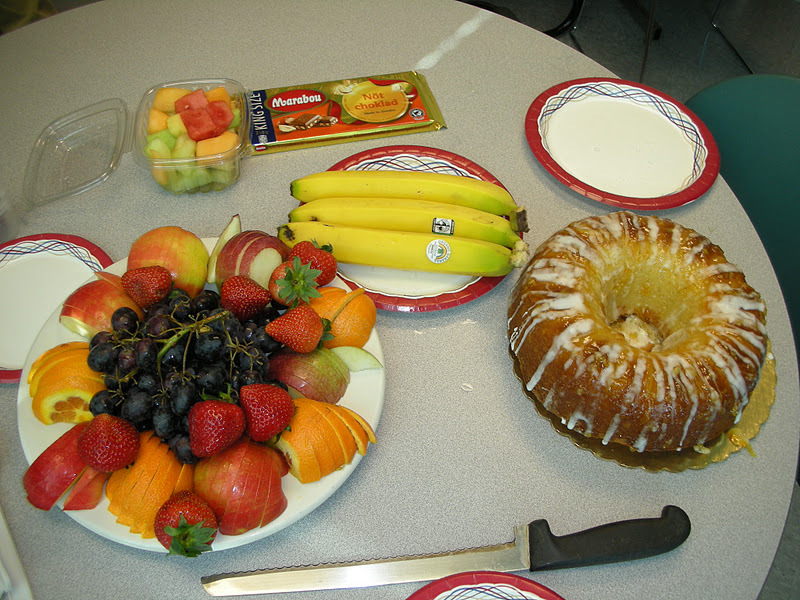 There was a large plate of fresh fruit sliced up and colorfully presented - ready to eat as it were. 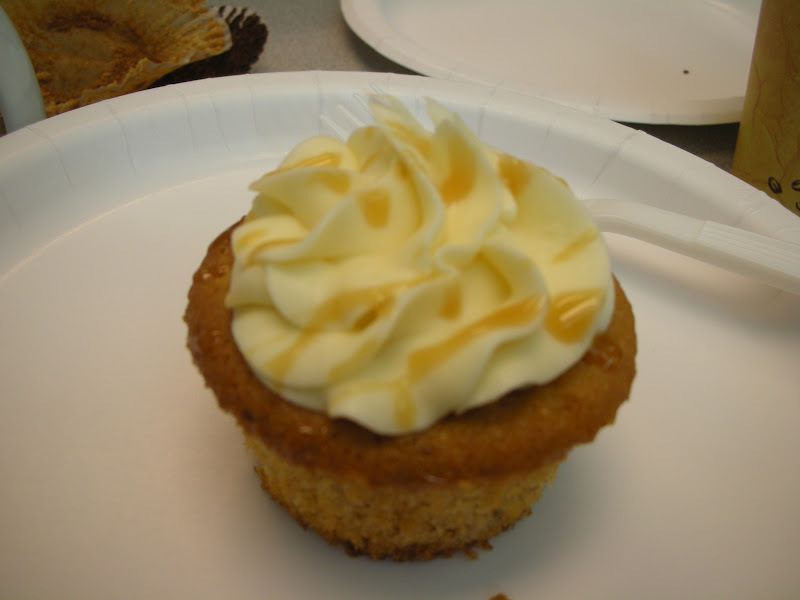 This was a nice touch and allowed the non-cake eaters to also participate in today's festivities. 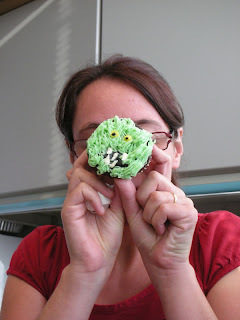 Special thanks to our new colleague who made quite an impression with the first cake hour! 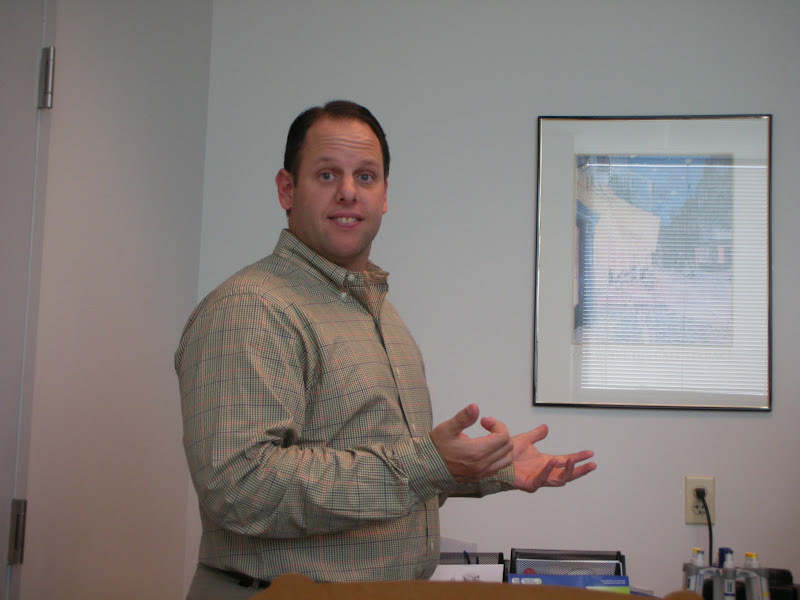 Our featured account rep courtesy of Eppendorf! 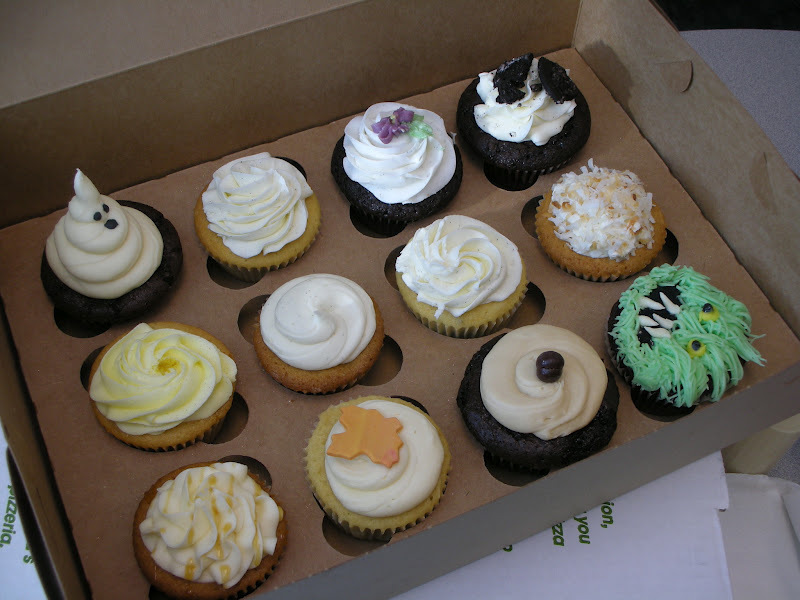 The Cupcakerie is very good and it being the month of October which features Halloween our sales rep of the day picked up a few of their cupcakes that were decorated according to a Halloween theme. 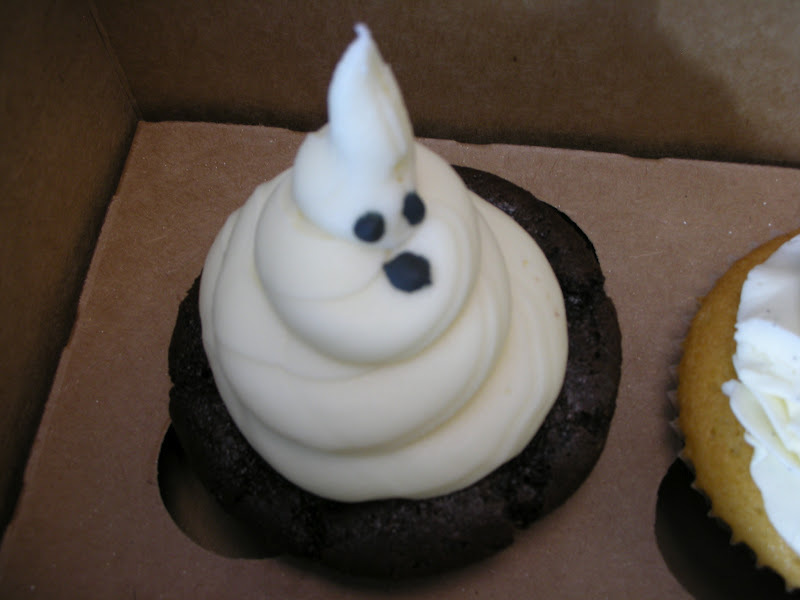 These included a chocolate cupcake with the frosting shaped in the form of a ghost - very clever! 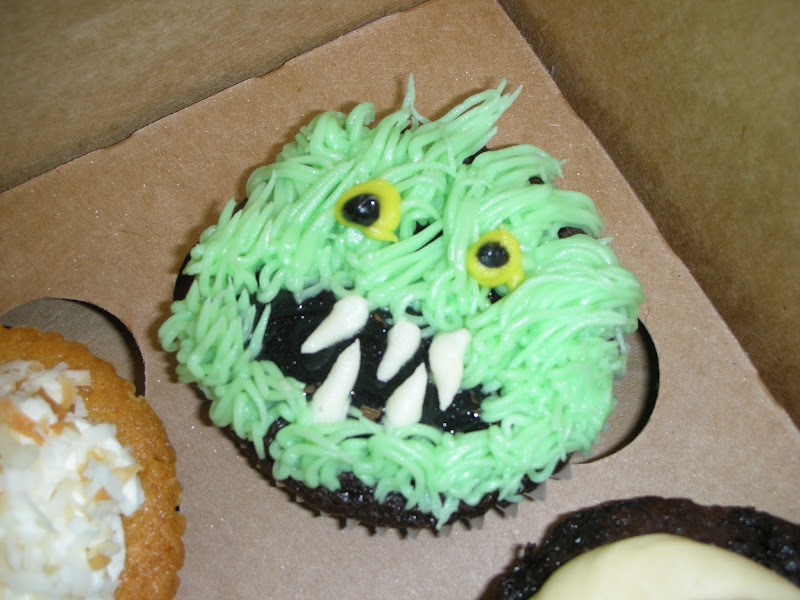 There was another with the frosting used to make a caricature of a muppet like monster - very cute! 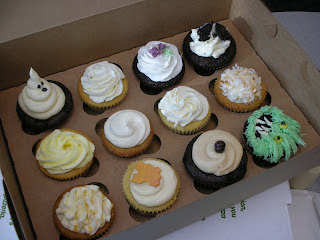 There was another spice cupcake with a cookie in the shape of a leaf for an autumn theme and a number of their other classics. An autumnal creation? We can't remember! All in all the selection of cupcakes was very good as was the selection of promo products that be brought along including pens, cups, and even some massage pads or something similar. The end result was that everyone was happy with both the sweet selections from Eppendorf and the selection of sweets from the Cupcakerie! 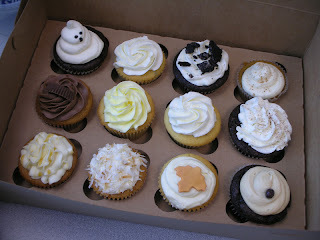 We had a few left over so we sent them home with a colleague to give his kids a pre-Halloween treat!.